These rotator cuff muscles are commonly injured or affected. In order to diagnose which rotator cuff muscles is affected by the injury or pathology, each muscle has to be isolated and tested. The best test for examination of the supraspinatus muscle is the Jobes Test or the Empty Can Test (Figure 2). During the Jobes Test, the patient’s arm should be anteriorly flexed at the level of the shoulder. Then, the patient will fully pronate the arm into the empty can position with the thumb pointing downward. The patient should resist the downward force being applied on the forearm by the examiner. Pain or weakness during the test indicates a supraspinatus tendon lesion. The infraspinatus muscle is a strong external rotator of the shoulder. The infraspinatus muscle is tested by testing the external rotation of the shoulder with the arm to the side. The main component of this test is the external rotation of the arm against resistance, so the examiner will passively rotate the arm into full external rotation. A positive test result is indicated when the examiner releases the patient’s arm and the patient is unable to maintain the position of full external rotation (Figure 3). The teres minor muscle is tested using the Horn Blower’s Test. External rotation is tested with the arm held in 90 degrees of abduction. A positive test result is indicated if the arm falls into internal rotation (Figure 4). 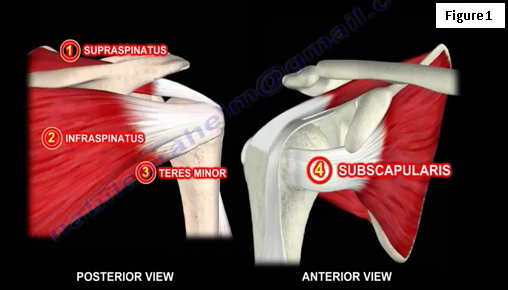 The subscapularis is an internal rotator of the shoulder. There are several tests for the subscapularis. The first test is known as the Belly Press Test. The patient is standing with the hand of the affected arm resting against the stomach with the elbow anterior to the mid-axillary line. The patient is then asked to press the belly against the affected arm without moving the elbow. Failure to maintain the elbow anterior to the midaxillary line while pressing against the belly indicates predominantly a subscapularis tendon tear. Another test for the subscapularis muscle is referred to as the Bear Hug Test. During the Bear Hug Test, the patient is asked to place the palm of the hand onto the opposite shoulder with the elbow anterior to the body. The patient will maintain the internal rotation of the shoulder in this position and the examiner will then attempt to externally rotate the arm. A positive test result is indicated when the patient shows weakness of the arm compared to the opposite arm. Both the Bear Hug Test and the Belly Press Maneuver test the upper subscapularis muscle (Figure 5). The Lift off test is a good test for the lower subscapularis muscle. During the Lift off Test, the patient is standing with the affected arm internally rotated behind the back so the dorsum of the hand will be resting on the lumbar area. The examiner will passively lift the arm away from the patient’s back. Once the examiner releases the arm, failure to maintain the position of the arm away from the back will indicate a subscapularis tendon tear. Sometimes these tests are modified or changed and multiple tests will improve the accuracy for the same clinical diagnosis. The clinical diagnosis usually involves these provocative tests, which can be painful and the physician should warn the patient about having some discomfort during these tests. An MRI remains the best method for diagnosing rotator cuff pathology.